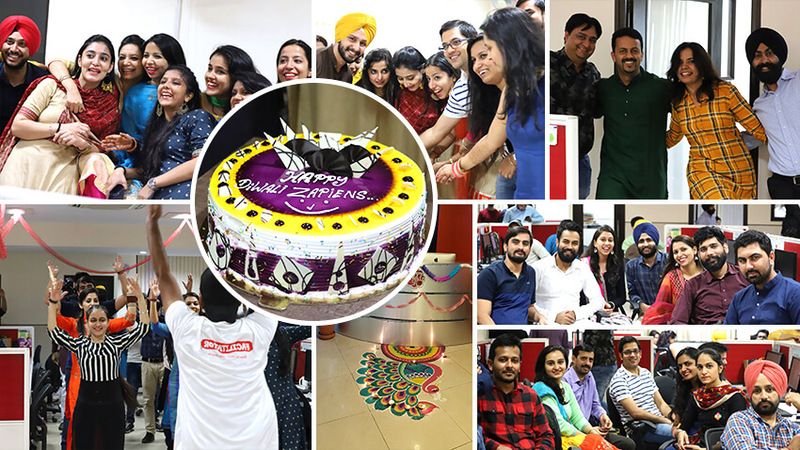 Earthen lamps, dazzling decorations, colourful rangoli, the warmth of togetherness and the chill of the upcoming winter season, that’s how we paint a perfect picture of Diwali celebrations at Zapbuild. Diwali, the festival of lights, is one of the most significant festivals in Indian culture. It holds an equally high significance for Zapiens too. Dressed in our newest and the best of ethnic attire, we celebrated this festival that marks the triumph of light over darkness and good over evil. What better way to have a rocking celebration than shaking a leg to our favourite songs? To make the most of the Diwali festivities, we had the instructor for JasKShan’s Dance Dacha who made us whirl and twirl on hit Bollywood and Punjabi numbers. Singing, dancing and laughing together, like one big happy family, we created innumerable memories that will keep bringing smiles on our faces in the times to come. Completely content with the fun session, we cut the cake to celebrate our unity and love for each other. It is this bond of care and concern for one another that makes us one and brings us together to celebrate all the moments of happiness.